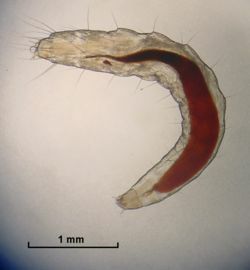 In Biology larva (plural larvae) is a distinct juvenile form of a developing animal that many animals pass before undergoing metamorphosis to the adult state. 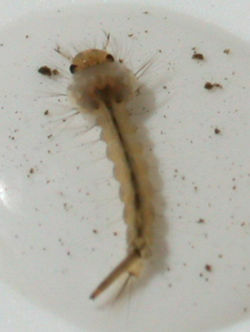 Larvae is very common among insects. The insects are either holometabolous, hemimetabolous or ametabolous. The first group mature to adulthood through the following four phases: embryo or egg, a larva, a pupa and the adult stage, or imago. The second group mature to adulthood through the following four phases: egg, nymph, and the adult stage, or imago. The last group display virtually no changes from immature stages to adult. Four orders of insects, namely, Coleoptera, Diptera, Hymenoptera, and Lepidoptera account for about 80% of all insects and are holometabolous, that means, has larvae. One of the important features of the relationship between plants and insects is the high degree of feeding specialization among herbivorous insects. This is an important factor in the study and control of pests in agriculture. Entomophagy (Greek: ἔντομος, éntomos, "insect", and Greek: φᾰγεῖν, phagein, "to eat") is the consumption of insects as food. Moth larvae are frequently consumed insects. Isaiah 14:11 describes the fall of Satan outlining his bed as full of maggots. In Job 25:6 Bildad the Shuhite states that man is but a maggot. ↑ 1.0 1.1 Grimaldi, David; Engel, Michael S (2005). Evolution of the Insects. Cambridge: Cambridge University Press. p. 4;331. ISBN 0-521-82149-5. ↑ Schoonhoven, Louis M.; van Loon, Joop J.A. ; Dicke, Marcel (2005). Insect-Plant Biology. Oxford: Oxford University Press. p. 6. ISBN 0–19–852595–8. ↑ Gullan, P.J. ; Cranston, P.S (2005). The Insects: An Outline of Entomology. Oxford: Blackwell Publishing. p. 10. ISBN 1-4051-1113-5. This page was last modified on 9 April 2013, at 19:09.